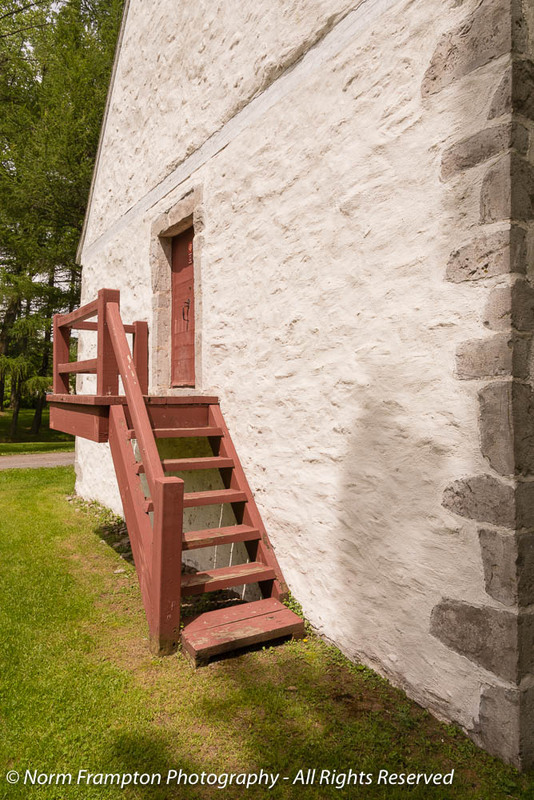 Built in 1786 by James Cuthbert who was the only English seigneur on the shores of the St. Lawrence River in the region just east of Montréal. Though not much to look at, this was actually the first Protestant Church in the entire province of Québec aka New France. For those wondering what a ‘seigneur’ is, they were the wealthy landowners at the top of the food chain, in a system of royal land granting and ownership based on similar feudal systems found throughout Europe at the time. The Seigneurial system was finally abolished here in 1854. 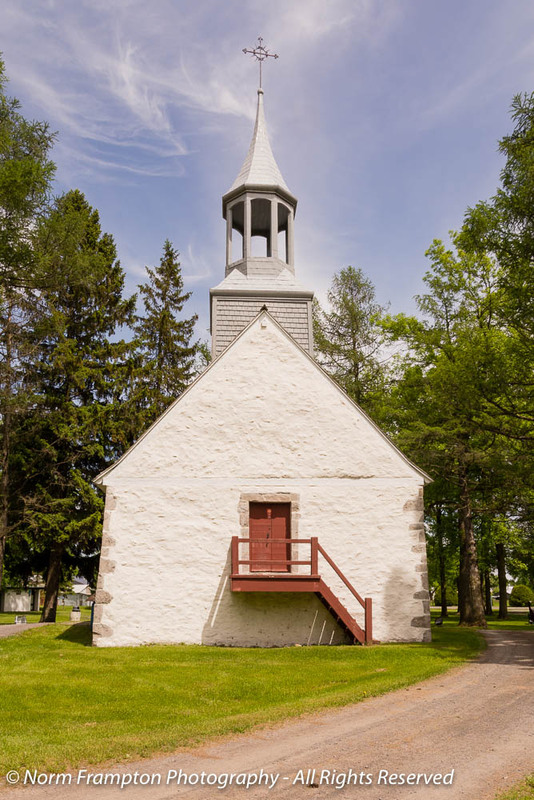 Originally named the Chapel of Saint-Andre, the building was acquired by the provincial government in 1927 and designated as a historic monument in 1958. 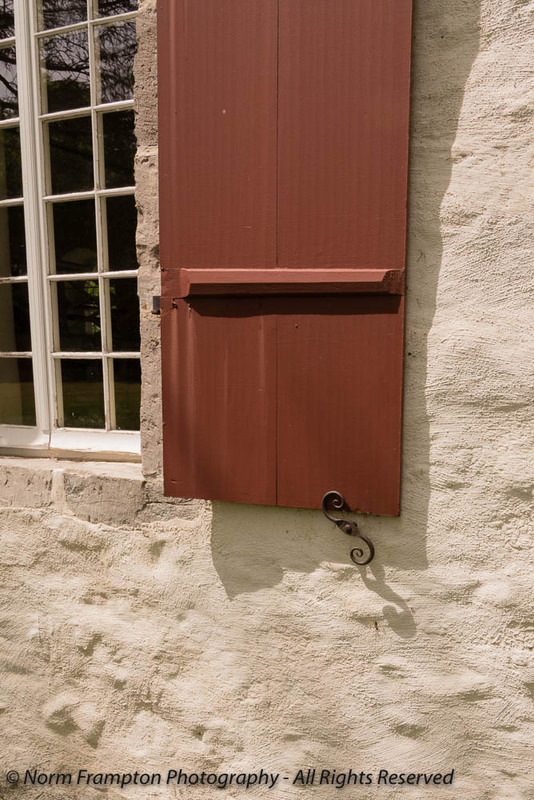 I love the little iron window shutter holders – such a nice touch. As you can see it is a pretty humble and basic structure. In fact the only thing that differentiates this old fieldstone building from the traditional homes built in that era is the steeple. 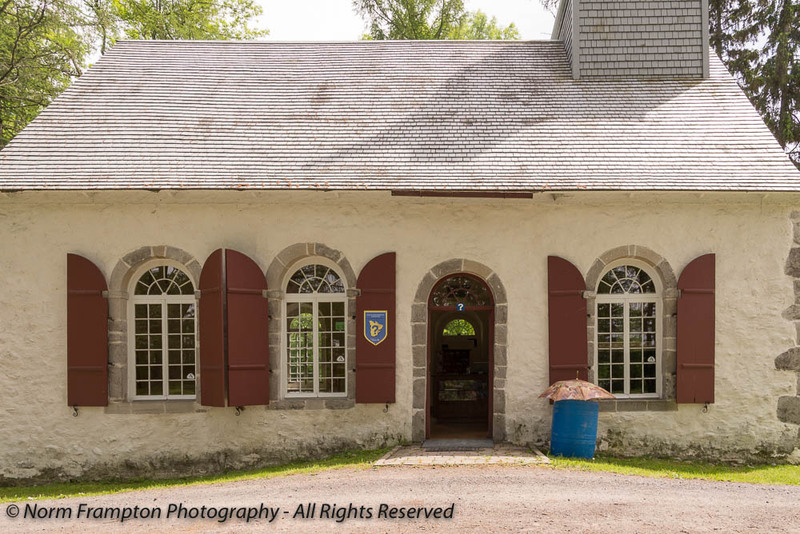 Located in Berthierville, just off of Route #138 aka Le Chemin du Roy (The King’s Road) today the building houses the local tourist info/visitor welcome center. Gallery | This entry was posted in Photography, Thursday Doors and tagged Berthierville, Canada, Canadian History, Chapel, Chapelle des Cuthberts, Chemin Du Roy, Church, Cuthbert's Chapel, Doors, Historic Architecture, Historic Buildings, Québec, The King's Road, Thursday Doors. Bookmark the permalink. My favorite part was how it was so cozily settled among pretty trees and then, you captured the shadows and lighting! This was a stunning photograph, Norm. 1786 is such a long time ago but it appears to be preserved in all its beauty! It exudes a simple charm and looks so serene and beautiful in its setting. I’m glad they were able to maintain this piece of history. What a lovely Chapel. I love the red accents. It’s beautiful, Norm, and in amazing condition for it’s age. Cute little church. I like the shutter holders too. Not much to look at! Au contraire! It’s charming! I love the arched windows, and shutters, the color of the stone & the trim, hardware, and that steeple. Reminds me of rural Pennsylvania. Beautiful stone. Lovely! That first picture looks like a painting – might not be that grand but it’s a pleasing sight for the eyes. Thanks Jan. You’re not the only one to mention that first shot. It’s growing on me. I might just print an enlargement of that one to frame and hang somewhere in the house. The beauty of simplify… I love it. Everything Judy said is quite right! Simply charming and quite lovely. Nice and sturdy looking..must be quiet and cool on the inside. A place for quiet reflection:) A nice one Norm. Your posts never fail to delight all Doorophiles. A simple, but very pretty church! Am glad the feudal system is abolished – it was short of slavery. My goodness, I knew you were in Lucca, but on Manja’s blog you commented that you were there in 2013 – the same year we were there in June. Yeah Jesh, the feudal system here was helped along by the Catholic Church, but it really was about keeping the working class in their place with very little hope of upward mobility. So simple, so beautiful, so unlike so many modern churches. Simple things are often the most beautiful. This building is an example of that! Not much to look at? I think it’s quite charming! Those are the kinds of churches in which I actually feel closest to the divine. Thanks so much – glad you liked it. Thanks. I would think that Cuthbert is a rather common name, so no, I doubt there’s any relation. 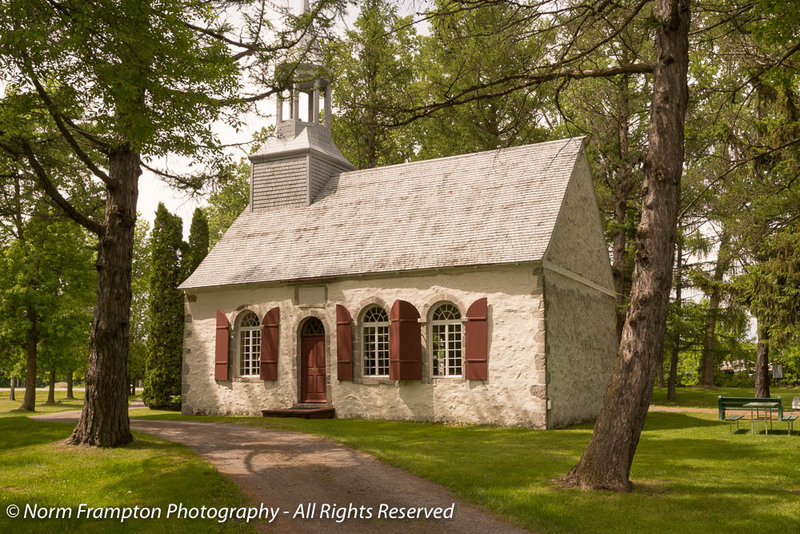 Lovely chapel – someone keeps it in great condition! At first I thought the top photo was a painting. A lovely building. I didn’t even know there was an English seigneur! Thanks Susi. I wasn’t familiar with any myself. It does make sense though that there were English fellows who knew how to play both sides well enough to benefit from whichever system was in place. Thanks Joey. They have some sorta stucco/mortar covering the stone walls to even out the surface from the different sized stones but the fieldstones are only visible on the corners. It makes for a unique look. Your Indiana limestone was popular for a time around here too. A number of our grander structures were built using it. That’s really helpful, thank you. So now I’m wondering what makes fieldstone what it is — cut with corners, as opposed to cobblestone? Maybe I should Google a bit. I just checked the wiki page, it explains it well. 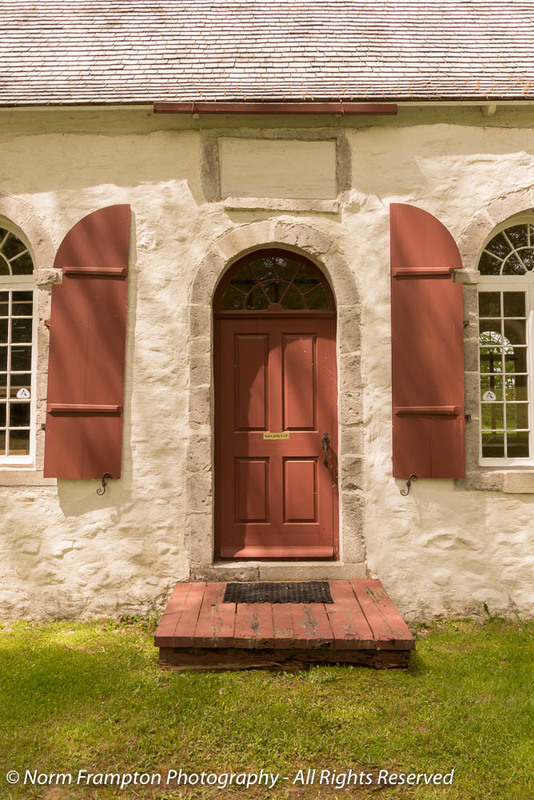 You see lots of old fieldstone homes in New England and eastern Canada. The striking thing about this type of construction is how incredibly solid it is. That’s a beautiful little chapel, Norm. I’m glad it’s being well maintained. I like the colors and the little set of stairs to the side door. I love oh the sign mimics the shutters. It doesn’t appear that my pingback made it. Of course, that means it will show up as soon as I post this comment. Thanks Dan. I agree, they’ve done a wonderful job preserving the place and putting it to good use. That’s a little beauty, Norm! The doors and shutters make it very attractive. So quaint but so lovely. One thing I am noticing about these old churches. They all have red or red toned doors. Thanks, you’re right. Red doors do come up a lot in older churches. I’ll leave it to someone who knows more about it to speculate as to why that is. Lovely old building. 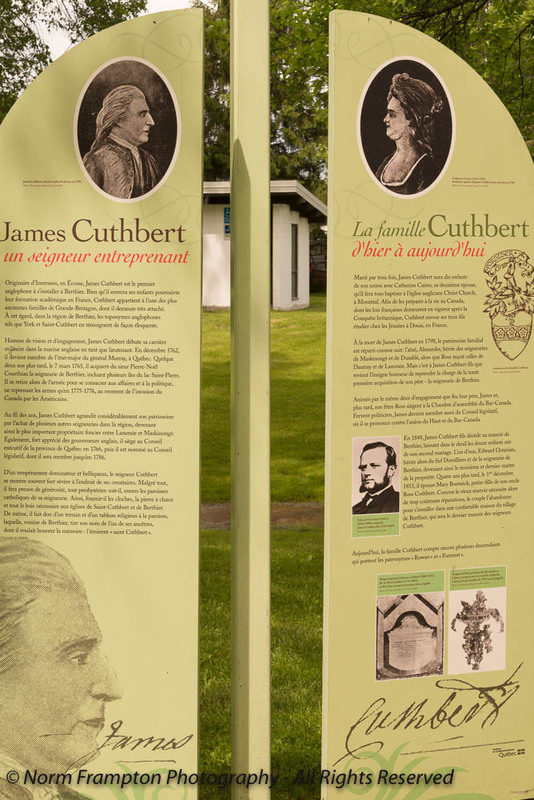 Very interesting to read the link about the Seigneurial system and how it shaped Canada. The ending of It postdates the French Revolution considerably. I don’t mean to imply any similarities.